I had a month off drinking recently. In fact, a month off every kind of intoxicant that you can think of, paracetamol, caffeine – everything. What has this got to do with roast dinners, I hear you ask. I’m not entirely sure either. But there is always a risk after a big night out that there is an inability to achieve the one and only goal of the day, especially after a 15 hour session. This week though, I had extra incentive as I had the company of my favourite Polish plumber, Tarquin (otherwise known as Ben). And he was driving. Which was lucky as the random number generator had picked a pub out in the countryside that would have meant using a bus and a 30 minute walk from the nearest bus stop, which I don’t think my fragile state could have handled. Actually it wasn’t entirely random. It was skewed as unbeknown to me I had listed it twice on my to-do list. But rules are there to be broken, as I may not have said to my mother when the police charged me, aged 13, with trespassing on railway lines. Kids, if you are reading, don’t go on railway lines. Gravy is much more fun. 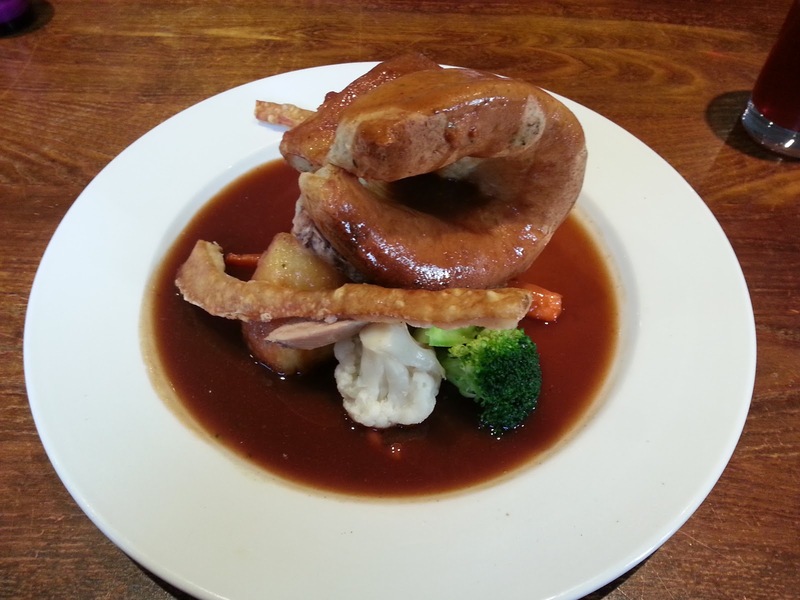 So without further ado, I bring you a roast dinner review of the Castle Inn, in Hurst, brought to you in association with Sunflower Plumbing. The Castle Inn is a traditional country pub, with low ceilings and warm feelings, next to a bowling green. Roasts are served midday until 4pm – beef and pork were the choices, though the chicken dish was also amendable into a roast dinner. It was £18.95 for two courses – if I recall correctly it was £13 for just the roast, perhaps £14. I did try to enquire via their website form however I did not receive a response. The website only suggested that food was served – no clarification on whether roast dinners were part of the offering. Though the Christmas menu was still on the website (it isn’t now). The website wasn’t especially helpful – I probably would have just assumed that it didn’t do roast dinners were I not on a mission to review all roast dinners in the area. Being a budding web designer I notice poor websites. Given the previous day and night’s alcohol consumption, my taste buds were not working in particularly good order. But my companion is not only an excellent plumber, but also an exceptional cook – no roast dinner has ever come close to those that he has cooked for me. The dinner arrived after around 15-20 minutes. It was well presented and came with a separate bowl of vegetables to share. The vegetables were copious and correct. Decent but nothing special, the carrots were soft and tender, the broccoli with a little more bite. The green beans though were quite exceptional – quite stringy and on the thin side – Sainsburys basics these were not. I do not normally come away raving about a vegetable but these really were quite exceptional. My friend advised that a hint of mustard was included in the cauliflower cheese. I cannot say that I noticed. The cauliflower cheese was again generous, and creamy but very little in the way of a cheese taste. My driver was not too keen on it been on the plate, however I was not concerned. What did annoy me, and this is just a fractional irritant, was the apple sauce on the plate – I probably should have mentioned when ordering that I didn’t want the apple sauce (which my driver believes was just from a jar) as this inadvertently contaminated the Yorkshire pudding. Said Yorkie was very large and home-made. My plumbing adviser believes that it was cooked in beef dripping rather than oil. Perhaps just a tad too long in the oven as it was a little more on the crispy side than preferred. Crispy is also the word for the roast potatoes. Yes, three weeks in a row I have had good roast potatoes. In fact these were very good. Probably the best roast potatoes I have reviewed so far. There were 3 slices of pork loin. Not quite as generous as the rest of the meal but more than sufficient, and pleasantly succulent slices with a little fat. I like a little bit of fat. The cracking was crunchy and edible but nothing special. Annoyingly it was laid on the apple sauce. The gravy was good. Not too strong a taste, not that I could taste anything properly anyway, and a reasonable consistency. My calling card for extra gravy was met swiftly and sufficiently with a good-sized pot of gravy. In fact the service was really good throughout, guiding my delicate state through the process and even anticipating my request for the Yorkshire pudding (not on the menu for the pork) without me even having to say anything. It having been International Women’s Day yesterday, I should also mention that the barmaids/waitresses were pleasingly attractive. Overall the theme was one of generosity and the rating will match. The quality was there too, minus a couple of imperfections though it was a shame that I could not fully appreciate the roast dinner in my delicate predicament. I do fully recommend this roast and give it a rating of 8.1. Next week’s roast will be somewhere along the Reading to Waterloo train line. Well, that’s the plan anyway. Happy Birthday To Me. Let’s Eat Some Gravy. Yes it was my birthday weekend, so I could break all the rules I wished which included drinking red wine for breakfast but more pertinently, revisit an establishment that I had already reviewed. It being my birthday I had decided to invite my friends to come for a roast at the 2014 RDAR winner – The Crown, in Playhatch. There has to be a good reason to revisit a venue, under new management for example, or a new chef being in place (The Lyndhurst is back on my to-do list), but in this case I just wanted to go back to my favourite, take as many friends as possible and hope it is still as good as last year. I packed a very healthy-sized dinner for just £13.00. A carvery choice that included turkey, gammon, lamb, pork and beef – I had the latter three. I don’t think I could have put any more on my plate – and I held the queue up whilst I poured more and more and more gravy on – though this time I didn’t leave a gravy trail like I did the other week at a venue in Northamptonshire (there was no protesting that it was nothing to do with me – the trail led all the way onto my table – it was their fault for serving such small plates). The choices of vegetables were red cabbage, carrots and broccoli-cheese. I just had the broccoli as it smelt gorgeous, and tasted so too. The cheese was just the right amount, more than a hint and mixed in a creamy fashion with the gravy. The broccoli was a tad on the crunchy side but a very healthy vegetable. I know I should have had all 3 vegetables for the review but my birthday, my rules. The roast potatoes were a decent effort. Not really any crispiness on the edges but still soft inside. If anywhere can do really good roast potatoes this year then they may take the crown off…The Crown. The Yorkshire Puddings were excellent. There were some flatter offerings but mine had sturdy edges and soft bottoms like they should – I only went for two. There were little bits of crackling too which were very tasty and not too crunchy. All of the meats were good. The beef was a little red on the inside, which is perfect. The pork was good. The lamb in particular was very nice. It is always nice to see large lumps of meat and the portion-sizes were generous. And most importantly, the gravy. It had an excellent consistency (I would make it thicker myself but it probably wouldn’t appeal to the average southerner), it was made with a meat stock and was quite a strong taste. In fact possibly a touch too strong as I did get a little tired of it towards the end of my very large meal. Sunday was a success. Several people told me it was the best roast they have eaten in a while. Everyone was impressed and it remains my favourite roast dinner. My rating is an 8.7 which is almost the same as last year. It remains top of the roast dinner league. However I have a feeling that somewhere will beat it, somewhere will take the crown off The Crown. A ha ha ha ha ha ha. It wasn’t funny the first time was it? If you appreciate my reviews, please do like, share and invite your friends to my page. Call it my birthday present, if you wish! of the random number generator – there is no over-riding it. or slow-roasted belly of pork. advertised as coming with a red wine jus. pork. Slow-roasted belly of pork. It sounds good doesn’t it? Sunday – we arrived around 4pm and it was busy. vegetables came on a separate serving plate. notably-tasty, especially when mixed with the mash and jus. just the slightest hint of apple and again, went really well with the jus. it didn’t need any liquidity. I may need to review my antipathy towards jus. friend was raving about his plate of chips. A suitably impressive score of 8.2 out of 10. Reading, was a trip to The Crown in Playhatch, just slightly out of town. the roast be pleasing to the taste buds? offer was beef, lamb, pork, turkey and gammon. between all carvery-goers so it was a sparse treat. perhaps a little more squidgy than ideal. Good but not perfect. broccoli and cheese – it was really tasty. The gravy was unlimited, and had a decent consistency. extra effort to drive slightly out of Reading. At £13.49 it provided excellent value for money too. and the waitresses were very attractive. available in the restaurant and only one in the bar. A thoroughly excellent roast dinner – 8.8 out of 10. I highly recommend it. Maybe I will manage more than one review this year? 3rd in my occasional series of local roast dinner reviews. 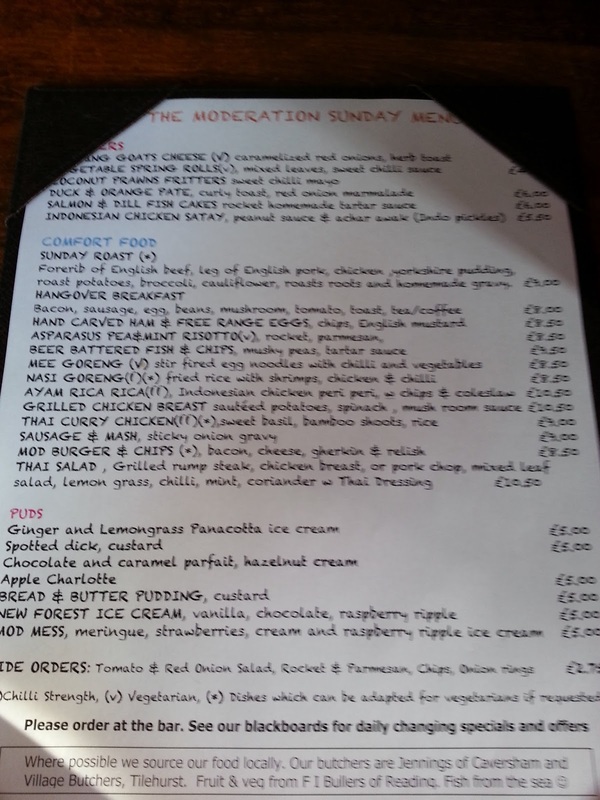 I haven’t been to The Moderation for some time, it is a nice, modern pub just about in Caversham. I was pleasantly surprised to find the roast dinner listed for only £9.00 – I am sure it used to be a higher price. Pork, chicken and beef were the options on the menu. Except they only had pork left. We didn’t have to wait too long, around 15 minutes – the pub was moderately busy for a Sunday early evening, plenty of seating available. The roast dinner was well presented, if a tiny bit on girlie size (or is that just my above-average belly talking?). A very impressive looking Yorkshire Pudding. The cauliflower and broccoli were fine, a little tougher than I personally prefer. The carrots however were sensational, some of the best I have ever had – if only there were more than 6 thin strips of carrot. Not often I say that. Good roast potatoes. Roast potatoes at a pub seem to be the easiest thing to get wrong but they were good. Onto the important bits – the pork was nice and tender however with only two slices, this was a little disappointing. It seemed like it was an attempt to conserve the meat as they were running out. Decent bit of crackling, and the Yorkshire Pudding was excellent. Finally, the part you have all been waiting for – the gravy. It was one of those homemade gravies which doesn’t really sit naturally with a Northern palette, but this was a good gravy, a decent consistency and there was plenty enough on the plate. 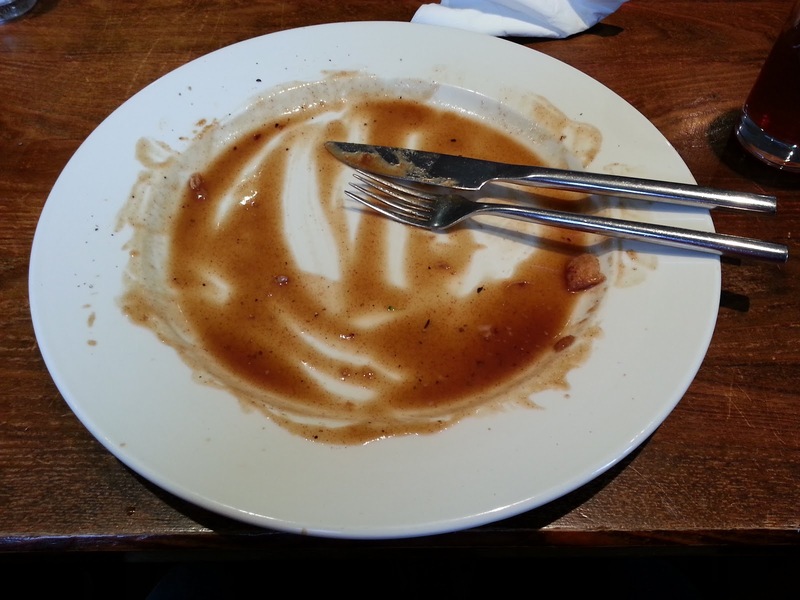 The empty plate would suggest that it gets the James Winfield seal of approval as a roast with good value for money, with room for improvement.